My Halloween weekend was spent at a design competition where I exercised my UX muscle and redesigned a product. 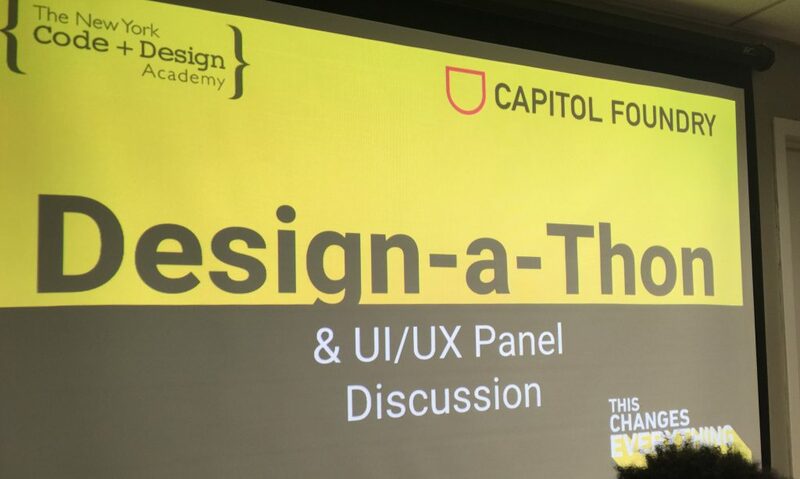 This past Saturday on October 29th, I participated in the Design-a-Thon & UI/UX Panel Discussion hosted by the New York Code & Design Academy (NYCDA) and sponsored by Capitol Foundry, a design and development firm. 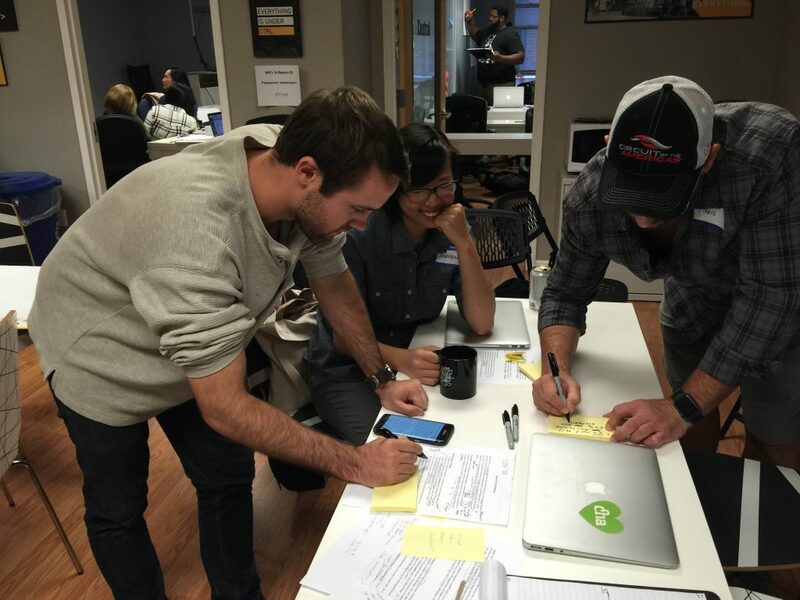 It was an all-day hackathon geared towards UX designers of every level. I love these events because they allow me understand my strengths and weaknesses. Here is an overview of the event, the process to attacking the challenge and my takeaways. New York Code & Design Academy’s first ever Design-a-Thon & UI/UX Panel Discussion featured (1) a workshop that introduced user experience design, (2) a hackathon portion for participants to solve a design challenge, (3) a discussion panel of industry experts and finally, (4) a presentation and pitch of the final product. I paid $15.00 for the entire day and I have to say that this experience had an amazing return on investment. NYCDA currently offers full-time and part-time courses in web development and UX design. They also host great events in the evenings and any upcoming ones can be found on their website. The first part of the event was an introductory workshop on user experience design led by Jimmy Chandler, founder of UX Principles and the instructor of the full-time UX design course at NYCDA. This presentation covered the fundamentals of UX design including what it is, the value of it and the various roles in UX. 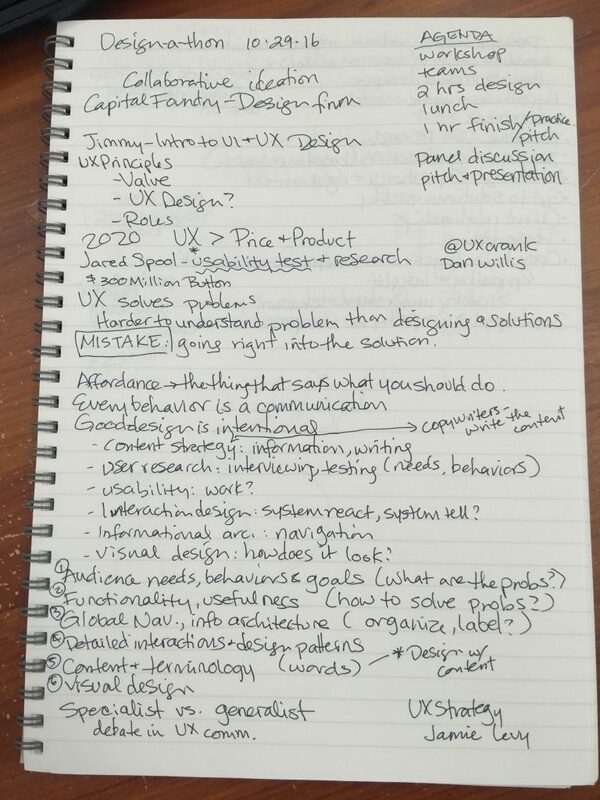 It was incredibly useful to get a clear breakdown of what goes into UX design. The full presentation can be found here. I do wish that the user interview and usability testing portion of the workshop was expanded. This would significantly drive home the value of research in design. After a brief coffee break, we were introduced to the challenge that was to consume us for the next couple of the hours. 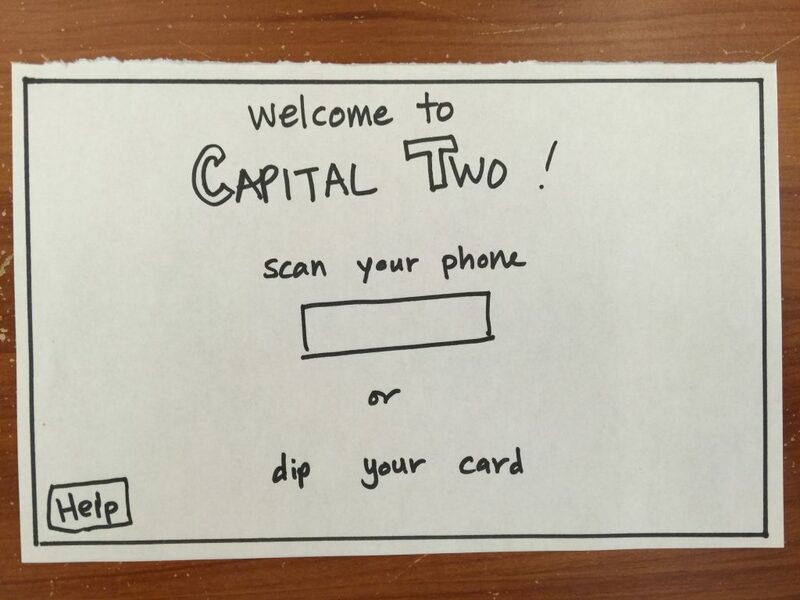 We have been hired by Capital Two bank to redesign their ATM interface experience. They’ve also provided us with some of their research findings of their mobile app usage as well as who their average user is. In order to encourage us to mingle and work together with people we don’t know, we split into groups by drawing numbers out of a bowl and looked for matching numbers to find our group mates. My group consisted of Christina, the architect and designer, Zeno, the business development/product manager and Mario, the staffing expert (or the Italian from New Jersey who carries a huge wad of cash – you’ll see why that’s relevant later). I, of course, was the research-loving troublemaker and was tasked with facilitating the team. As we dove right into the challenge, I could tell that we were an energetic and fearless group. We complemented each other well and someone had a skill that another did not. Once we settled, we reviewed the prompt and analyzed the research points. Now, I’m up for any challenge but this was an entirely new level. ATMs are becoming obsolete nowadays so why was our challenge about redesigning something that will eventually disappear? I must’ve obnoxiously repeated this to my group when I said, “I feel like we’re being asked to redesign the fax machine.” At this point, I still didn’t understand why Capital Two felt the need to redesign the ATM interface experience when other areas of the business could benefit more. Regardless, a challenge is a challenge so we went right in. If we think about the functions of an ATM, we’re able to break it down into some simple tasks of withdrawing cash, depositing checks, reviewing accounts and transferring funds. Most of them can be done on a mobile app or through the website. In order to get a better sense of what direction we should go in, we identified the various pain points associated with using an ATM interface. Assuming that the average ATM user is a 34-year-old person with a smart phone, he or she would only be using the ATM a couple of times a week to withdrawal cash. Another discussion topic amongst us was the scenarios in which a user would go to an ATM for cash. Perhaps a user went to lunch with a friend. If one user needed to pay the other back, we already have Venmo to take care of that issue. 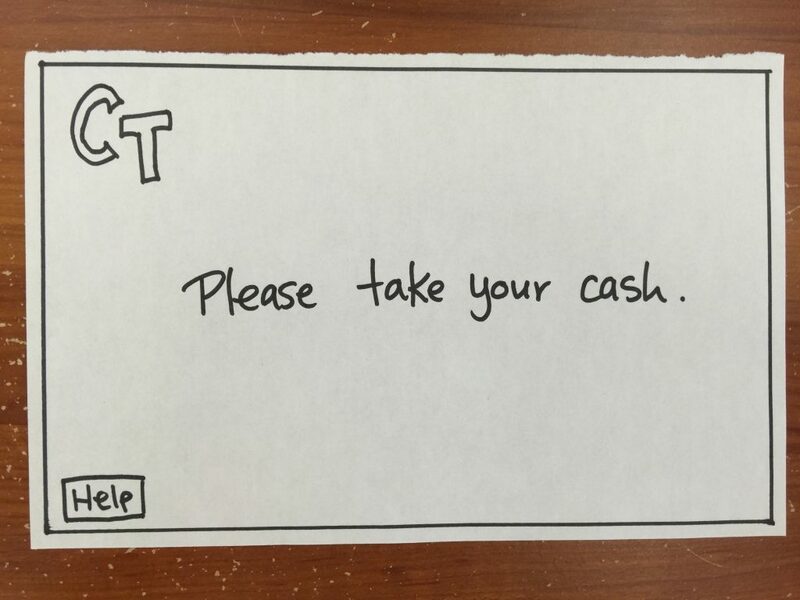 Although most places in New York City accepts cards and Apple pay, there are still places that are simply cash only. I’ve also been to places that typically accept cards but have malfunctioning machines so they have no other choice but to accept cash. In the end, however, this discussion wasn’t as relevant but helped us understand that people still use cash. It’s an undeniable factor that the need for cash isn’t completely gone. That’s why ATMs still exist. But is the experience great? We know that even today, users spend a lot of time in front of an ATM just to get their cash, which can cause frustration. ATMs, in general, deal with a lot of sensitive information and transactions so users feel vulnerable the longer they stand in front of them. Ultimately, our proposed solution boiled down to speeding up the process to eliminate that vulnerability factor. How can we do that? Let’s eliminate the ATM interface. You must be wondering, “Hold up. Wasn’t the challenge about redesigning the ATM interface itself?” Yes, that’s right. But we wanted to create a solution. The act of withdrawing cash shouldn’t be as cumbersome as it currently is so we figured that the best way to approach this was to eliminate as much of the ATM interface as possible. Risky? Sure, but we thought this was a great way to test out an innovative approach without any pressure. 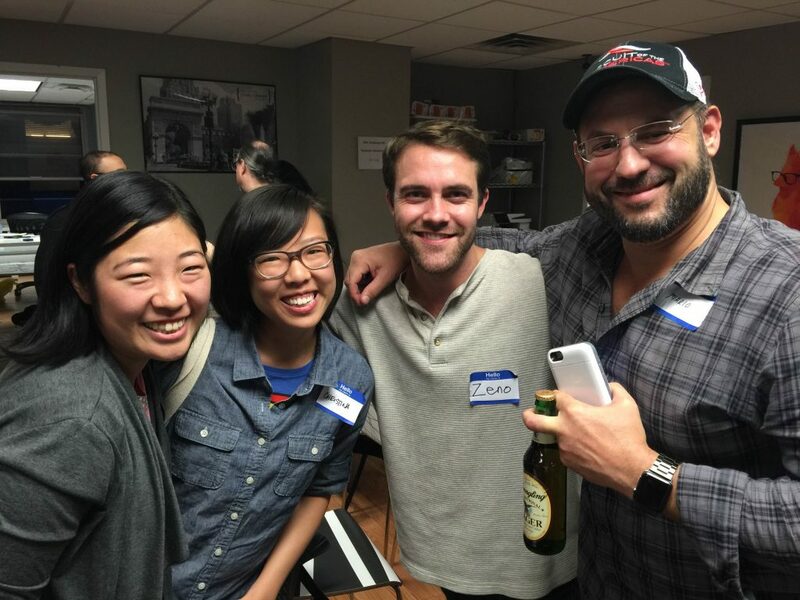 Plus, hackathons are supposed to be fun and we wanted to get creative with this challenge. 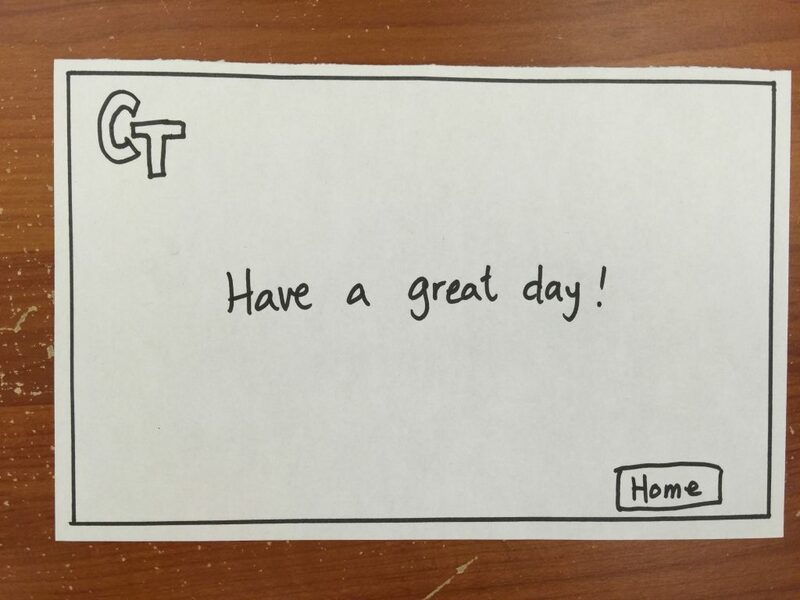 We began to develop our concept and designed a rough wire frame of the ATM interface. We also made sure that as we developed our product, we thought about how to communicate our vision to the panel of judges, especially after learning that we only have two minutes to present our pitch. Our solution was to eliminate the cash withdrawal transaction from the ATM interface and switch it over to the app. With this new feature, users would now be able to request cash on-demand from their app and receive it from any supporting ATM with the tap of a button. For users without the mobile app, we provide the alternative option of inserting their cards and withdrawing cash the traditional way. ideating and developing our concept. The goal for our product was to make users feel secure. As a business, Capital Two would also benefit from this because it would increase app usage and get people in and out of ATMs at a much faster rate. Throughout the process, we also discussed the various ways that our design could fail. We asked ourselves how users could safely authenticate themselves because identity theft is a real issue. All of us agreed that the process to input a PIN causes a lot of anxiety so we got rid of that feature in our ATM interface redesign. In the end, what we created was a simple and seamless experience for users to get their cash without having to think too hard about it. Security was our main priority and we attacked the issue by speeding up the process. After the hacking portion was finished, we were introduced to three panelists who are industry experts in UX design. They were Emil Skandul, principal of Capitol Foundry, Seth Cheeks, senior designer at Google, and Natasha Levitan, senior UX designer at Goldman Sachs. They shared various insights as to what makes for design good, how they feel about various debates in the UX community and what the future of design looks like. Important questions such as “What makes a good designer?” and “Where is UX design going?” were addressed during the talk. Each had compelling things to share and I learned a lot from them. Natasha emphasized the importance of understanding data and designing the way that it is communicated. Emil encouraged us to find the things that no one wants to work on and go do it. Seth, as someone who loves to use various design programs and tools, stressed the importance of having the ability to learn a new program as they come along. Right now, tools like Sketch and InDesign are relevant but they may become obsolete in the future and it’s critical to keep up with the current tools. Following the engaging panel, it was time for all the groups to present and pitch their products. I have no idea how we managed to communicate over three hours of hacking work into a two-minute presentation but we managed. Instead of taking a deep breath and spewing a summary of the work we did at the speed of light, we kept our pitch concise and simple and ultimately, let the videos do the talking. Several other groups came up with similar concepts of eliminating most steps in the cash withdrawal process. team 7 for the win! In the end, we ended up placing second and tied with another group that came up with a similar concept. The fact that another group thought of what we came up with validates the need for this idea. I can imagine more banks utilizing their mobile apps to minimize the user-ATM interface interaction as much as possible. Eventually, in the future, there may not even be a need for ATMs in general since we are moving toward a cashless culture. After the project, Zeno sent out this article to us showing that Apple patented a crowdsourcing, peer-to-peer mobile banking concept where users post requests for cash and fellow, nearby users can provide that money when there aren’t any ATMs available. We don’t have that problem in New York City but it’s still a great solution for users in other geographical locations. I enjoyed this event a lot and would definitely attend more in the future. 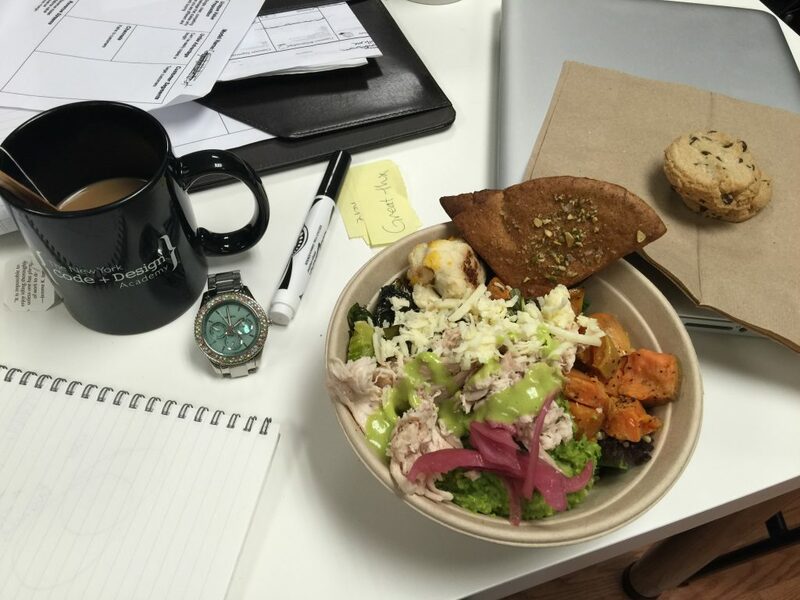 Hackathons can be extremely limiting with time and resources so every single thing cannot be covered. 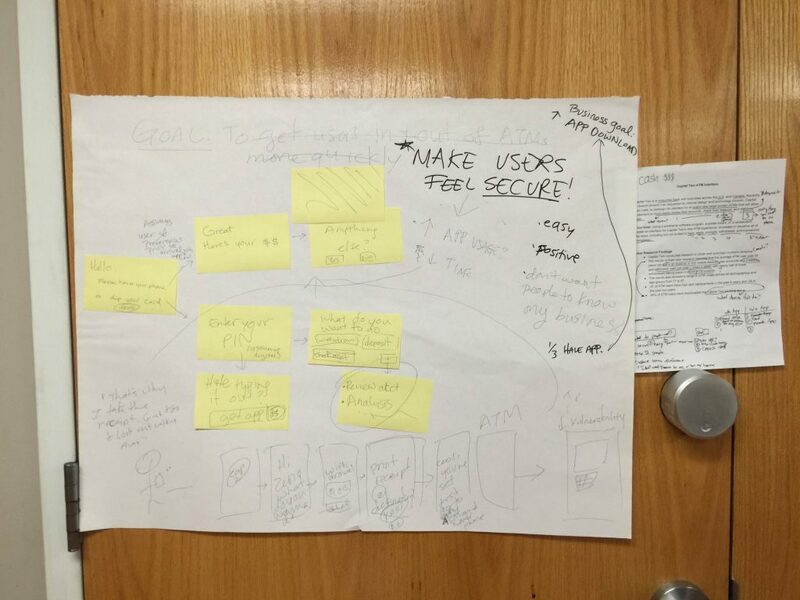 Considering that we were working under tight time constraints, our group managed to put our heads together to create a solution that addressed multiple user pain points. Since there was emphasis on the beginner-friendliness of this event, I would have loved to have a few more design mentors for guidance and feedback along the way. It would also have been great if the panel discussion was held after Jimmy’s introductory workshop because a lot of what they shared was great practical advice. Working on this project allowed me to understand the kind of work that goes into creating innovative solutions. 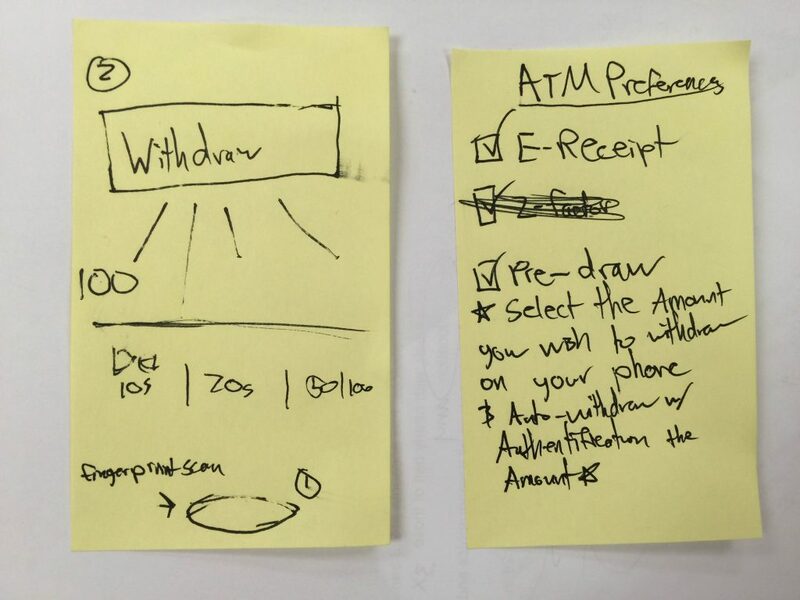 I realized that when there is a set user journey for a particular experience (in this case, the process of using an ATM to withdraw cash), it’s hard to create a redesign that doesn’t interrupt with what users are comfortable with. I also realized that because our solution was incredibly simple and bare, we had moments of uncertainty since users are used to the current procedures. It was a great challenge and I’m looking forward to the next one!